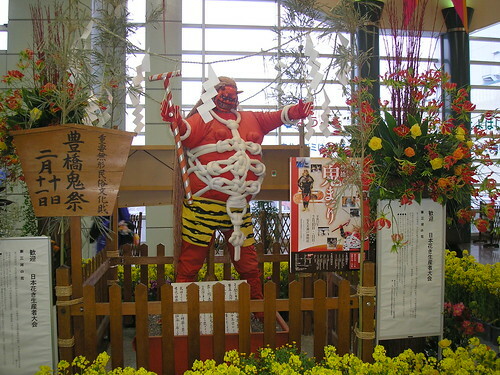 Every year, since the Heian period (794 – 1192), the Oni Matsuri (鬼祭り), or ‘demon festival’ has been celebrated in Toyohashi. (I should note at this point that ‘oni’ is also sometimes translated as ‘devil’ or ‘ogre’.) 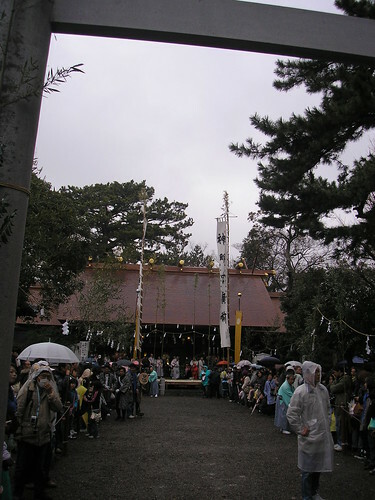 The annual festival takes place at Akumi Kanbe Shinmeisha Shrine on 10th and 11th February. On February 10th the blue/green demon goes around the town. This demon is called ‘aoi oni’ in Japanese. Confusingly, ‘aoi’ actually means blue, but the demon is green-coloured. 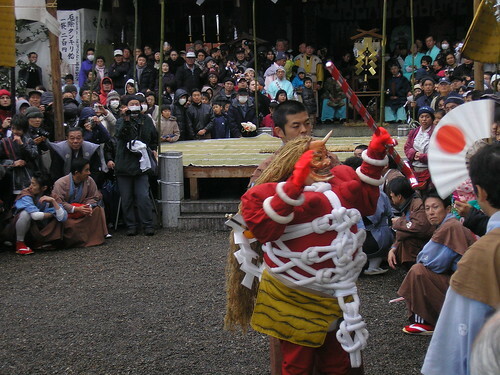 Anyway, 11th is the main day, and on this day the ‘aka oni’, or red demon, comes to the shrine and fights with the ‘tengu’, which is a long-nosed goblin. The tengu wins, and the red demon runs away. 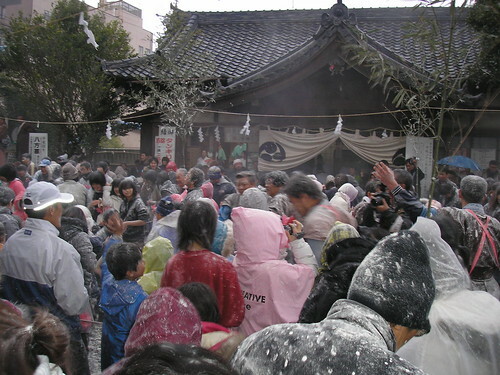 As he runs away, he scatters ‘tankiri ame’ (boiled sweets) and powder (flour) for expelling evil. Apparently, if you are showered with this powder, you will not become ill during the summer. 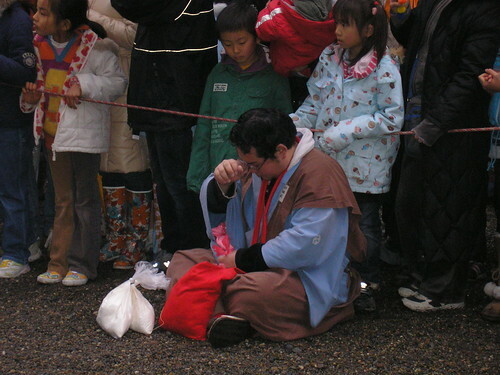 This festival also celebrates the coming of Spring, and our happiness for the coming year. 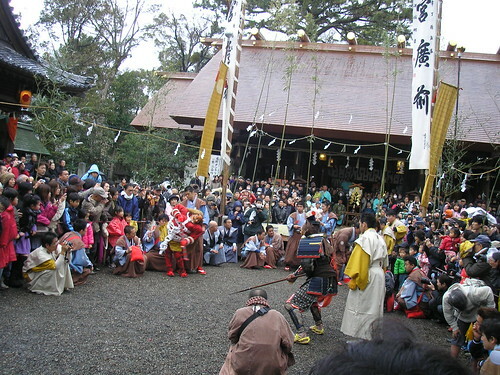 During the festival, there were a couple of times when you could be touched on the head by one of the devils (I got the black one and the red one – no idea about the meaning of the black one!) and this is supposed to bring you luck. All kinds of floury hell breaks loose as aka oni runs away! Outside my friend’s grandma’s house where we were warming up, was an oni resting point. To kill the time, people were setting off small fireworks here. They were really noisy and looked pretty dangerous! 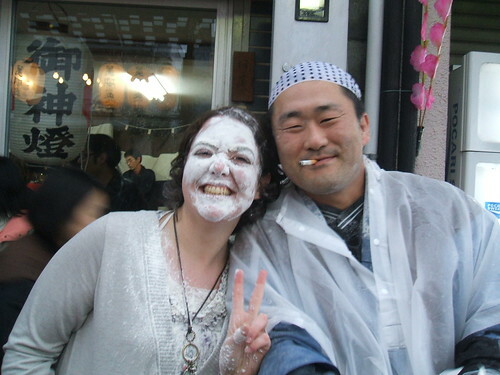 After the aka oni had rested and was ready to go again, this Japanese guy asks me if he can rub flour in my face when the oni leaves. The conversation was half in English and half in Japanese, and my friend was like “go on! !”, so I thought “what the hell?”… And the guy got two great big handfuls of flour and rubbed them in my face! I figured, either he really wants me to be lucky and healthy all year… or he has some weird fantasy about rubbing flour in a foreigner’s face… He seemed like a nice guy though! This was certainly one of the most interesting festivals I’ve been to in Japan so far! It was a shame it was raining, especially as that meant that the flour sort of turned into glue on our clothes and shoes!! 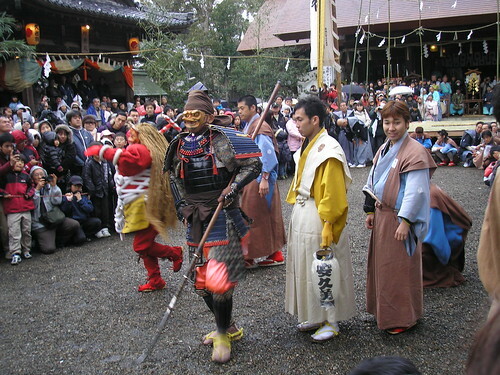 The festival itself was a little slow, and the oni/tengu fight/dance seemed to go on a long time. 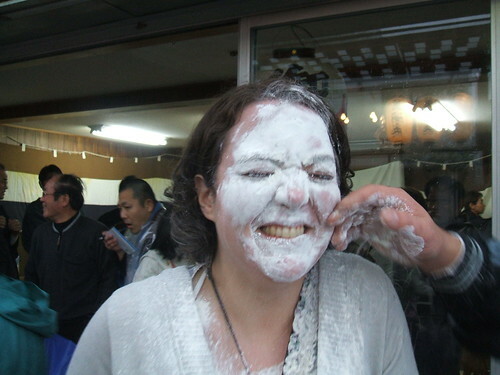 But the flour fight was really fun, and I would go back just for that! 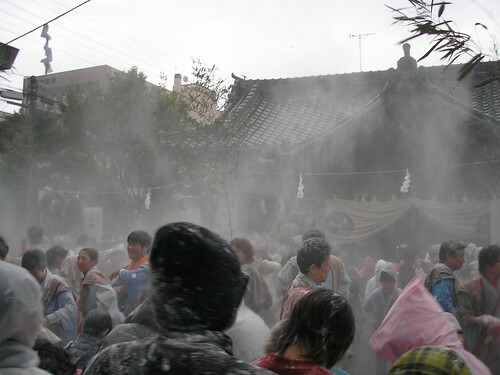 Someone recently wrote an interesting blog about ‘weird festivals’ and kindly linked to my Honen Matsuri post from last March. 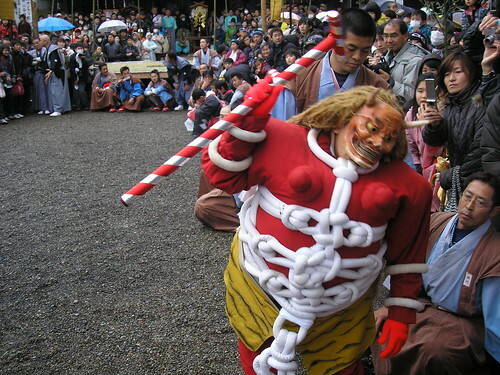 This has got me thinking now… what other weird and wonderful festivals are there to be experienced in Japan? I thought I had heard of a tomato festival, but that seems to be somewhere in Europe. 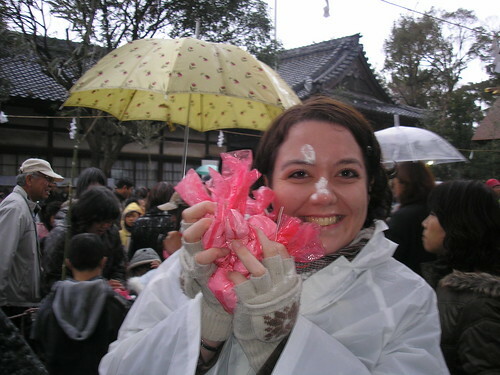 Can any of you readers recommend any more interesting festivals in Japan?? There’s a tomato festival at West Dean, near Chichester. They also have a chili festival and an apple festival – nowhere near as interesting as yours though! The Tomato (La Tomatina) festival is in Bunyol, Spain, and I’ve heard it’s insane. Almost as bad as the running of the bulls in Pamploma, Spain. Seems like almost every country has something unusual. 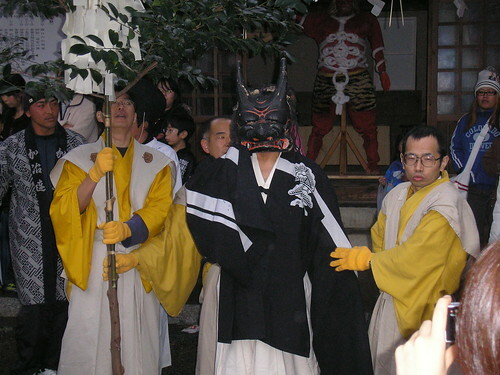 Although Japan seems to have more odd events than almost anywhere else. I enjoy reading your blog, this was a very nice entry! Fantastic picctures! I can’t help with the festival question but I really enjoyed this. Thank you for sharing! 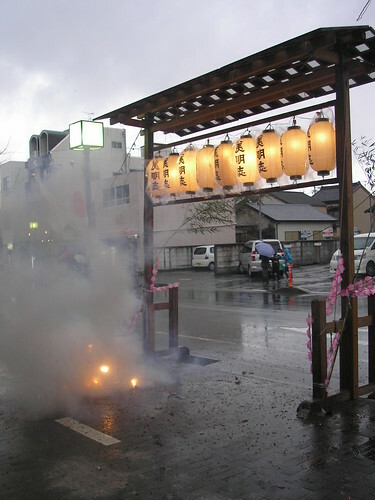 Also, there's this crazy fire festival in a tiny town called Hazu called the Toba Hi Matsuri (鳥羽火祭）. It a short walk from the station, Mikawa Toba (三河鳥羽）　on Meitetsu. At this one… they build these huge bonfires, and then two teams of guys (dressed in these festivals costumes that make them look like neko! ^_^) race to pull out a sacred tree from their team's fire. so exciting. they like catch on fire and fall off.. and the fire is falling all around them. so cool. Gujo Hachiman Odori in Gifu (郡上八幡 おどり）。　Dance the bondori until your can't walk straight ^_^ We went during Obon when they dance all night! well it’s just fun to share! ^_^ thanks for stopping by my place! right on that’d be awesome! thank you! !